It is officially Winter in my area- We’ve finally got snow over the weekend, and now it’s super cold and everything is frozen so I think it is sticking for a while. Before it got too cold I bundled up the kids to have a little play time out in the snow, sledding, going down the slide and a little shoveling. They were loving it! Typically this time of year we are already covered in snow and it was a little sad to have no snow for Christmas. But nothing else has gone according to my plans this year, so why not that too! 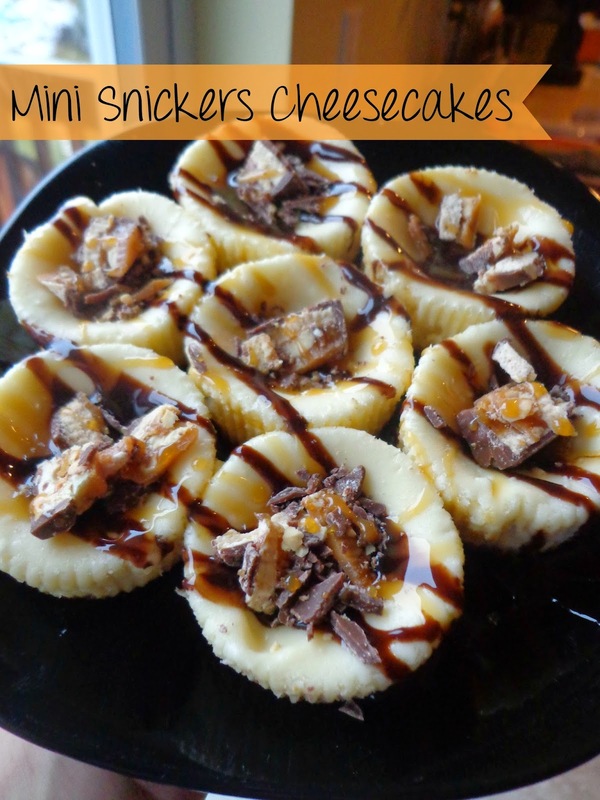 Anyway, lets talk about these Mini Snickers Cheesecakes. I found this recipe for Mini Snickers Cheesecakes on Pinterest, and since I’ve been on a bit of a cheesecake run this year I wanted to give them a try. They are supposed to make 32 and there is no way I want 32 of these little babies sitting around my house so I made them and took them to my sister in law’s cookie exchange. When you first are baking them they puff up a bit, but don’t you worry, they’ll go back down! These cupcake size cheesecakes are perfect for a few delicious bites. But you know what else I did? Since I only have 2 cupcake pans that hold 12 each, I used my mini cupcake pan that holds 24 and I made a batch in those too. I didn’t take a picture but they looked just like these, except that they were bite size. That almost could be more dangerous because you can just pop them in one at a time! Preheat the oven to 325˚ F. Line cupcake pans with paper liners. In a bowl, combine the graham cracker crumbs, melted butter and sugar. Stir together with a fork until well blended and all the dry ingredients are moistened. Press 1 tablespoon of the mixture into the bottom of each cupcake liner. (I used one of those wooden tart pressers) Bake until set, 5 minutes. Set aside. To assemble, spoon 3 tablespoons of the cheesecake batter over the crust in each cupcake liner. Bake until the filling is set, about 22 minutes, rotating the pans halfway through baking. Let them cool completely and then transfer to the refrigerator and let chill for at least 4 hours before serving. When you are ready to eat, just drizzle cheesecakes with caramel and chocolate syrup and top with cut up pieces of Snickers. They were a total hit and I loved them so much that I made them for dessert when we went to my husband’s aunt’s house for Christmas eve dinner. I guess I have a new favorite! I have to say that these are so unbelievably easy to make. Almost too easy! The biggest thing is giving yourself enough time for them to sit in the fridge for 4 hours before eating! But you don’t regret it…. Well…. Actually, you might if you love cheesecake! Your cheesecakes look amazing! I love Snickers and cheesecake is one of my favorite desserts…this is so tempting!! Pinning and sharing…thank you for sharing them with us at Foodie Fridays! Thank you Michelle! They are so delicious! Thank you for stopping by. Okay. That does it. I’m making mini cheesecakes this weekend. And I’m starting with this recipe!! Thanks for linking up with #FoodieFridays this week! I hope you did! They are so delicious! So yum! And I am trying to be good so they are the perfect size! Yes, They are perfect size, but don’t let them deceive you! They are so delicious you want to keep eating them! haha!